Look at the faces. Listen to the words. These are people who helped form the state of Israel. Shalom Masswari speaks nonchalantly of self-induced starvation, undertaken to make himself small enough to be smuggled out of prison in a suitcase. Zelig Gonen stands beside the bicycle he used to traffic a basket of Molotov cocktails across an Arab war zone. Eliahu Shavit crouches above the Jerusalem sewer holes he once crawled through as a saboteur, planting bombs. Munio Brandwein gazes at the olive trees he planted where three friends lost their lives. 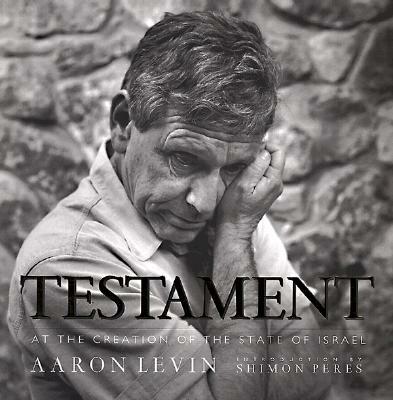 In Testament, American photographer and journalist Aaron Levin heralds the men and women behind the founding of Israel on its 50th anniversary. Transcribed from interviews, sometimes translated from Hebrew, the essays that accompany each portrait in Testament tell of the extraordinary events that transformed everyday lives. Along with the soldiers, civilians, and kibbutzniks who contributed to the independence movement, there are photos and first-person recollections of such prominent Israelis as former Prime Minister Yitzhak Shamir, Nobel Peace Prize-winner Shimon Peres, and the former president of Israel and ambassador to the United Nations Chaim Herzog, now deceased. Aaron Levin's relationship with the landscape and people of Israel dates to 1969, when he lived and worked in a farming village while studying Hebrew. A professional photographer and writer who specializes in archaeological sites and artifacts, his work has appeared in several books about Roman and Near Eastern archaeology, and in such publications as The New York Times and Geo. A graduate of Oberlin College and the University of Baltimore, he lives in Baltimore, Maryland. Shimon Peres was director of manpower and later of arms procurement for the Haganah in 1947. During the War of Independence, he headed the naval department in the Ministry of Defense. He went on to serve as defense minister, foreign minister, and prime minister. Instrumental in Israel's struggle for autonomy, he was awarded the Nobel Peace Prize along with Yitzhak Rabin and Yasser Arafat in 1994.